2018 Advent Calendar is finally here!!! You have all been very excited by our big news and already our stock is getting low... to avoid disappointment, we recommend picking yours up now. How much tea is included in each box? Each advent day box contains between 4-10g of tea (Mostly 10g). On two advent days you will find Suki pyramid teabags. Also, there is a Christmas Day tea gift... no, we aren't spoiling the surprise, you'll have to wait until Christmas Day to find out. What will I find inside each advent box? We have popped 22 packs of loose leaf tea, 4 pyramid loose leaf teabags and one special Suki gift in to the calendar. You will find a range of Suki classics and also some blends which are unique to the advent calendar. 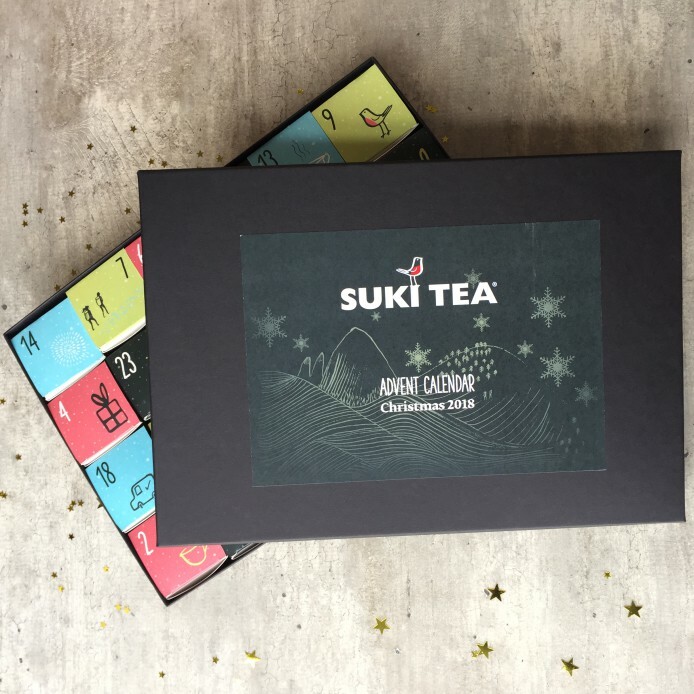 How can I buy a Suki advent calendar? The only place you can purchase our calendar is on our website. What is the price of the calendar? When will my calendar be delivered? Your calendar will be dispatched on or before the 19th of November, to ensure you get yours before December starts! Do you ship your calendars internationally? Yes, you can purchase a calendar and we will send it to you, wherever you are! There will be a postage fee for anyone outside of the UK. You can easily calculate this fee on our website. What size is the calendar? Until when can I order my calendar? In order to ensure that everyone receives their advent calendar before the 1st of December (we don't want you to miss the excitement of opening your first box on time) calendars will only be on sale until 19th November. However, they are selling very quickly and it is advised that you get yours ASAP as there is a very limited stock... You have been warned!! Hi are you able to tell me what are the teas for each day as this waa going to be a gift for my parents but they are not very adventurous and dont want it to be a waste. Hi Rachel! There will be a variety of teas in the advent calendar, it will include black teas, a few green teas, a fab white tea, some fruit infusions, some herbals and a couple of limited edition teas too. Just wondering are all the teas in the calender vegan? No sneaky Milk or honey? Hi Teresa, all our teas are Vegan friendly!! I’ve received my advent calender and I love it! Just a quick question, each tea doesn’t seem to be labelled and I wondered how I can find out which tea is in each date in case I want to order it for in the future. We're happy that you love your advent calendar as much a we do! We can't wait until 1st December so you can find out what is hiding in the first box! We didn't want to make the contents of our little tea boxes too obvious... but the the back of the main box will show you the day and the tea that's inside. Hope this helps!